Senators and Reps under the Parliamentary Support Group, PSG, would insist that Saraki resigns as Senate President to pave way for unfettered investigation, Daily Trust on sunday gathered. The lawmakers would rely on precedents that were set in earlier cases affecting the leadership of the National Assembly, where the Senate President or the Speaker of the House of Representatives undergoing investigation would step down. The fresh move by members of the PSG, it was learnt, was a response to a threat of impeachment to President Muhammadu Buhari by a joint executive session of the National Assembly. In a swift reaction to the resolutions, the PSG through Abdulmumin Jibrin, warned that the entire National Assembly should not be dragged into Saraki’s personal case. The response did not go down with other lawmakers as Jibrin was on Wednesday dragged before to the Ethics Committee of the House of Representatives. But a leader in the PSG told Daily Trust on Sunday yesterday that the group wants Saraki to step down as Senate President and face his case with the police. The ranking lawmaker said Saraki should honour the Senate, the legislature and the entire country by resigning his position, saying the legislature’s name has been dragged through the mud. Citing instances, the lawmaker, who doesn’t want to be named, said that previously, when four presiding officers were indicted at different times, they stepped down for probe. “One, when Adolphus Wabara was accused of collecting bribe when he was the Senate President, he was forced to step down, he went and cleared his name,” he said. He also recalled how Evan Enwerem, who was accused of certificate forgery, was forced to step down, but the case did not go to court. “Similarly, when Salisu Buhari was enmeshed in certificate forgery (scandal), his case went to court but he was later pardoned. Again, when Patricia Etteh was accused of inflating contract, she stepped down and at the end of the day, she wasn’t found wanting. So let Saraki follow the path of honour and do the same thing rather than drag the whole Senate and even the National Assembly into his personal problem,” he said. Making a reference to allegations against Senator Ali Ndume of having links with Boko Haram, he said rather than looking for a political solution, Saraki should clear his name for posterity. “Look at Ndume’s case when he was accused of sponsoring Boko Haram during the last administration, we were all with him but we asked him to go and clear his name. After six years, he was cleared,” he said. The lawmaker from the North, while describing the threat to impeach Buhari as empty, said its promoters had failed woefully. “It is just an empty threat because they know they cannot succeed. They wanted to rattle the Presidency to do their bidding on Saraki’s case. They are frustrated because it didn’t work. You know they first gave ultimatum and when they failed, they came up with the impeachment threat,” he said. The ranking senator said the lawmakers would force Saraki out if he refused to tow the path of honour should a criminal charge be brought against him. “The ongoing case is completely different from the one at the Code of Conduct Tribunal. If he refuses to give way, we will impeach him to save the sanctity of the Senate. 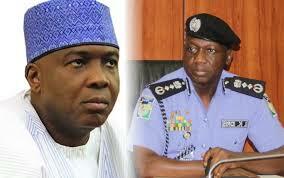 The integrity of the Senate is under serious trial, nobody sees us as leaders with conscience anymore,” he said. Backing his colleagues, another senator said it would be out of place for the upper legislative chamber to be led by someone undergoing a criminal trial.